The study subjects were trained runners, results may differ for noobs. I openly admit that the focus of my SuppVersity articles has rarely been on endurance exercises like running. I am well aware, though, that many of you are participating in 10k and or marathon runs and will thus be interested in the results of a recent study in the Journal of Science and Medicine in Sport - a study that tried to get to the bottom of the ambiguous results on the performance enhancing effects of minimalist shoe wear, which appears to be divided into studies supporting its efficacy and papers reporting downright performance decrements when runners are transitioned from classic to lightweight minimalist shoes. Table 1: Results of a meta-analysis of the effect of footwear on running performance & economy in distance runners (Fuller 2015). Fuller et al. realized, however, that there were "[n]o studies [that had] investigated the effect of footwear on running performance measured using a time-trial or time-to-exhaustion test" (Fuller 2015). 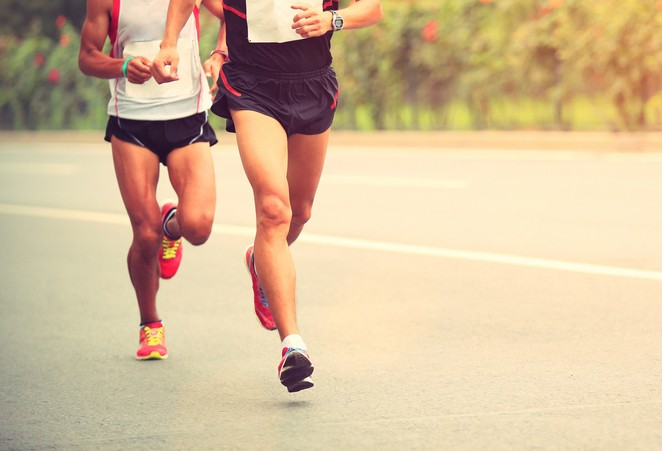 Meanwhile, other studies have suggested that wearing minimalist shoes (or racing flats) during running competition should be advantageous for running performance, as well. In fact, Fuller et al. are right to point out in their latest paper that "runners have been doing this for many years" (Fuller 2017). Should all these runners be wrong? Mislead by ads and the "cult" of barefoot running? "training in minimalist shoes did not improve running economy when (1) runners followed a flexible minimalist shoe training prescription that allowed them to increase minimalist shoe mileage from week 4-10 as they felt was appropriate or (2) prescribed use of minimalist shoes was combined with instructions to use a forefoot footfall pattern and increase stride rate" (Fuller 2017). With small sample sizes (n≤25), different instructions being provided to runners and, most importantly, the absence of study with standardized training regimen for both the minimalist and control shoe study, the research has yet eventually not gone beyond the pilot stage, anyway. What is a minimalist shoe and why would you even expect performance enhancing effects from minimalist shoes? According to what could be considered the "official scientific definition of a in Esculier, et al (2015), it is a "[f]ootwear providing minimal interference with the natural movement of the foot due to its high flexibility, low heel to toe drop, weight and stack height, and the absence of motion control and stability devices" (Esculier). According to the shoes individual characteristics, i.e. 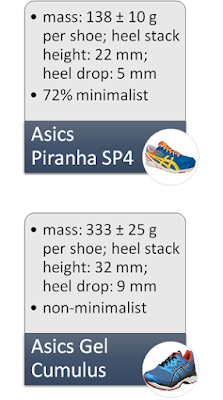 weight, flexibility, heel to toe drop, stack height and motion control/stability devices, experts can discriminate minimalist from regular sport shoes on a 0-100% scale, on which the Asics Piranha SP4 (mass 138 ± 10 g per shoe; heel stack height: 22 mm; heel drop: 5 mm) from the study at hand ranked 72%. Fuller et al. explain the expected benefit as follows: Since running in minimalist shoes can increase the tendency to make initial ground contact with the midfoot or forefoot, instead of the rearfoot, allow for an increased stride rate and plantarflexion moments at the ankle, the biomechanics suggest that "these changes will result in a more efficient running gait" (Fuller 2017). Running theory and biomechanics tell us that the way barefoot and minimalist shoe running promote a forefoot running pattern should have significant performance advantages, though. In the short term, i.e. when scientists had habitual rearfoot runners switch to a forefoot pattern in a single-session trial (e.g. Gruber 2013), though, the enforced change from a rearfoot to forefoot footfall pattern resulted in either similar or poorer running economy. No wonder, after all, runners find it difficult to maintain a forefoot footfall pattern throughout a prolonged run due to fatigue of the ankle plantar-flexor muscles (Jewell 2017). It is thus only logical that Fuller et al. 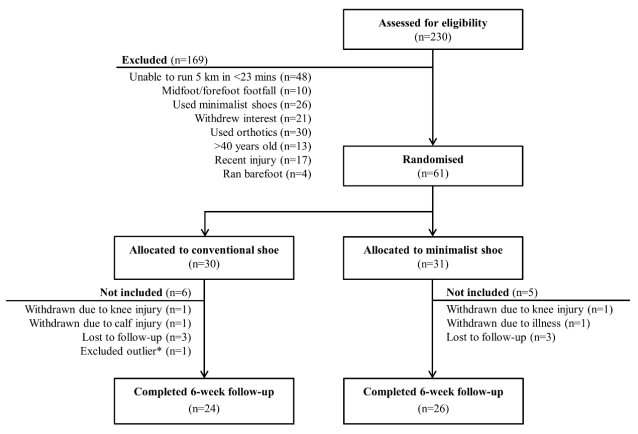 assumed that a study design that would allow their subjects to adapt to the novel requirements of a more forefoot-based running as it is enforced in minimalist shoes would make up for habituation and training and thus realize the previously explained (see red box) beneficial effects on both, running economy (has already been proven on the small scale) and time trial performance (hasn't been investigated, at all). To this ends, Fuller et al. 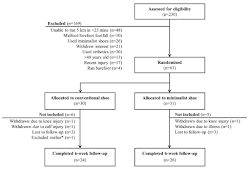 conducted a randomized parallel intervention trial with 61 trained runners who gradually increased the amount of running performed in either minimalist (n = 31) or conventional (n = 30) shoes during a six-week standardized training program. Figure 1: Participant flow chart (Fuller 2017) | * Participant excluded as an outlier after running 5-km time-trial 114 seconds slower at completion of the six-week training program. 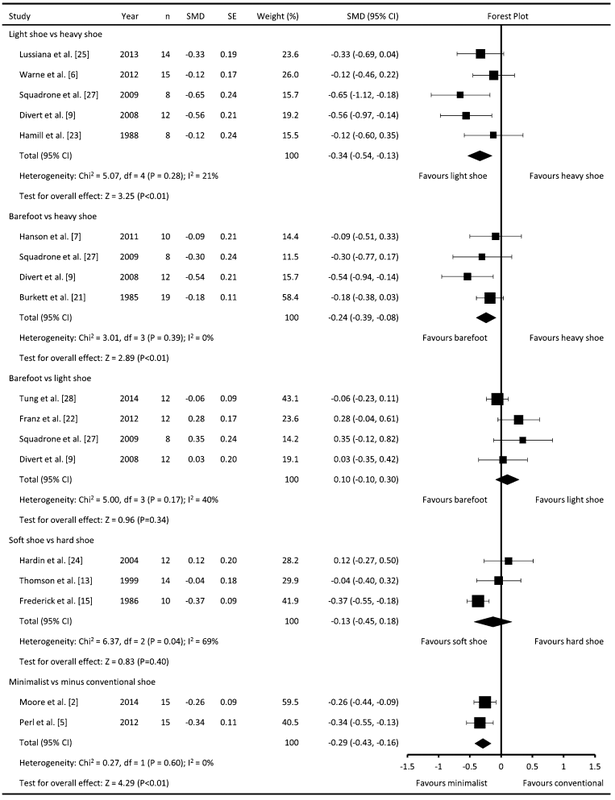 Training duration and relative intensity were standardized across participants. The training intensity was prescribed relative to peak heart rate (HRPeak) achieved during baseline 5-km time-trial assessment and involved two interval running sessions at 85-90% HRPeak and two continuous running sessions at 65-80% HRPeak each week. The duration of interval training was increased throughout the program so that a greater percentage of training was completed at high intensity (85-90% HRPeak). Participants were instructed not to perform any additional training. "Increasing minimalist shoe use to 35% of weekly running was chosen as a safe and realistic target for participants to achieve during the 6-week intervention. Participants completed a total of 3.5 hours (40-50 km) of running in their allocated shoes during the intervention. Compliance was calculated by dividing the total duration of training performed in allocated shoes (from training diaries) by the total duration of prescribed allocated shoe use" (Fuller 2017). It is thus possible that the subjects' adaptation process had thus only begun, when they performed the retests, i.e. a 5-km time trial performance, running economy, ankle plantar-flexor strength, footfall pattern, stride rate and length tests - the same tests all subjects had completed at baseline. Against that background, I find it all-the-more surprising that Fuller et al. 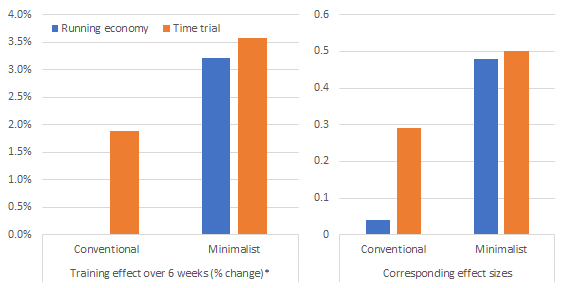 observed a small, but significant improvement in time-trial performance (Effect size (ES): 0.24; 95% confidence interval (CI): 0.01, 0.48; p = 0.046) and a medium, likewise significant improvement on running economy (ES 0.48; 95%CI: 0.22, 0.74; p < 0.001) in the minimalist vs. conventional shoe group. 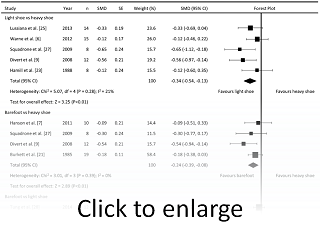 Figure 3: Training effect (left) as change (*for time-trial and the running economy those would be negative values, but I thought it's easier to read if I reverse that) and effect size for the pre-/post-comparison in the two groups (Fuller 2017). What the scientists didn't observe, however, were effects on stride rate (ES: 0.04; 95%CI: −0.08, 0.16; p = 0.53) or length (ES: 0.06; 95%CI: −0.06, 0.18; p = 0.35). ankle plantar-flexor concentric (ES: 0.11; 95%CI: −0.18, 0.41; p = 0.45), isometric (ES: 0.23; 95%CI: ‐0.17, 0.64; p = 0.25), or eccentric strength (ES: 0.24; 95%CI: ‐0.17, 0.65; p = 0.24); and even though the minimalist shoes caused large reductions in the ratio of rear-to-forefoot balance, (ES: 1.03; 95%CI: 0.65, 1.40; p < 0.001), only two runners changed to a forefoot footfall. You will remember from the Short News that that barefoot running triggers instant improvements in running economy, right? | learn more. So what's the verdict then? I have to revise the practical implications as they are outlined in the original paper a bit, because I think without my italicized additions, they are misleading: (1) Gradually introducing runners (but not switching them completely) to minimalist shoes over a six-week training block improves running economy and time-trial performance more than the introduction of a conventional shoe as an alternative; (2) minimalist shoes cause runners to use a less-pronounced rearfoot footfall, although in the study at hand only two runners used a forefoot footfall; and (3) minimalist shoes do not affect stride rate, stride length, or ankle plantar-flexor strength. As my additions to points (1) probably already suggest, there's one thing Fuller et al. 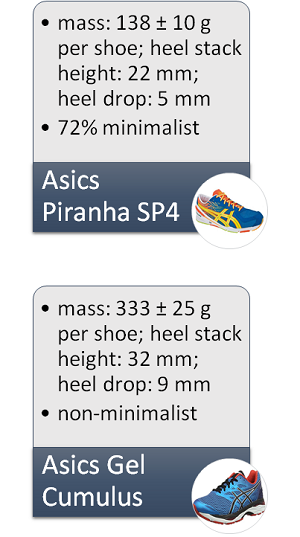 fail to emphasize enough; and that's the simple fact that their study only proves the benefits of adding a minimalist shoe like the Asics Piranha SP4 over the use of a regular shoe like the Asics Gel Cumulus (while these were the two shoes used in the study, the study was not sponsored by Asics) as a partial replacement in your running program. That's - just in case you didn't realize that already- why there has to be a follow-up study with (1) a control group that keeps running in their regular shoes for the whole 6 weeks and/or (2) a full transition to the new shoe (maybe over 12 weeks), before we can make general statement about the superior- or inferiority of minimalist shoes for trained runners | Comment on Facebook! Esculier, Jean-Francois, et al. "A consensus definition and rating scale for minimalist shoes." Journal of foot and ankle research 8.1 (2015): 42. Fuller, Joel T., et al. "The effect of footwear on running performance and running economy in distance runners." Sports Medicine 45.3 (2015): 411-422. Fuller, Joel T., et al. "Effects of a minimalist shoe on running economy and 5-km running performance." Journal of Sports Sciences 34.18 (2016): 1740-1745. Gruber, Allison H., et al. "Economy and rate of carbohydrate oxidation during running with rearfoot and forefoot strike patterns." Journal of Applied Physiology 115.2 (2013): 194-201. Jewell, Carl, Katherine A. Boyer, and Joseph Hamill. "Do footfall patterns in forefoot runners change over an exhaustive run?." Journal of sports sciences 35.1 (2017): 74-80.